Gov. 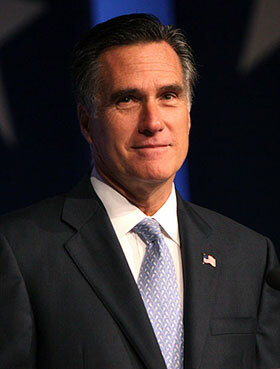 Mitt Romney, born in 1947, is the Republican nominee for President of the United States in the 2012 election. He previously served as Governor of the state of Massachusetts from 2003 until 2007, and is also known for his role in organizing the 2002 Winter Olympics in Salt Lake City, Utah. Gov. Romney ran for the Republican nomination in 2008, losing to Sen. John McCain. He is running on his strong business background, arguing that his experience in the private sector makes him the best candidate to improve America’s economy. Since clinching enough delegates to secure to nomination, Gov. Romney has begun to speak about his views on a number of issues. He has stated that marriage should remain between one man and one woman, and has argued in support of the Defense of Marriage Act. If elected, Gov. Romney has vowed to repeal the Affordable Care Act on his first day in office, and has also expressed a desire to bring the War in Afghanistan to a close by 2014. As the Republican nominee, Gov. Romney is now the face of the party; it will be his responsibility to articulate the party platform to the voters. If elected, he would become America’s first Mormon President.